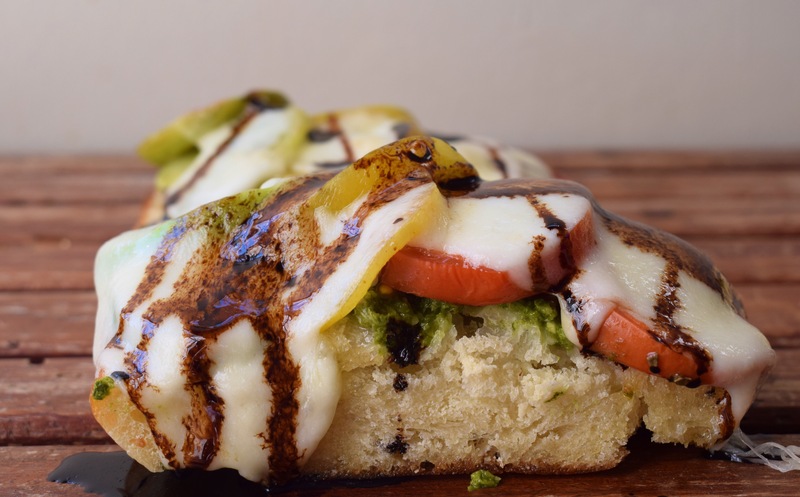 Well that recipe title is a mouthful, but not as delicious as the mouthfuls of hot cheese sandwiched between some incredible toppings. To the person who decided to marinate cheese- THANK YOU. I first came across the concept on The Kitchn and stopped in my tracks to try it. The only cheese I had in the fridge at the time was halloumi, and you can see for yourself how much I’ve enjoyed using halloumi. I marinated it in a tandoor paste to make these killer skewers a couple of months ago- seriously so good! Whilst in Europe, I fell in love with sandwiches. I know, so terribly common of me. 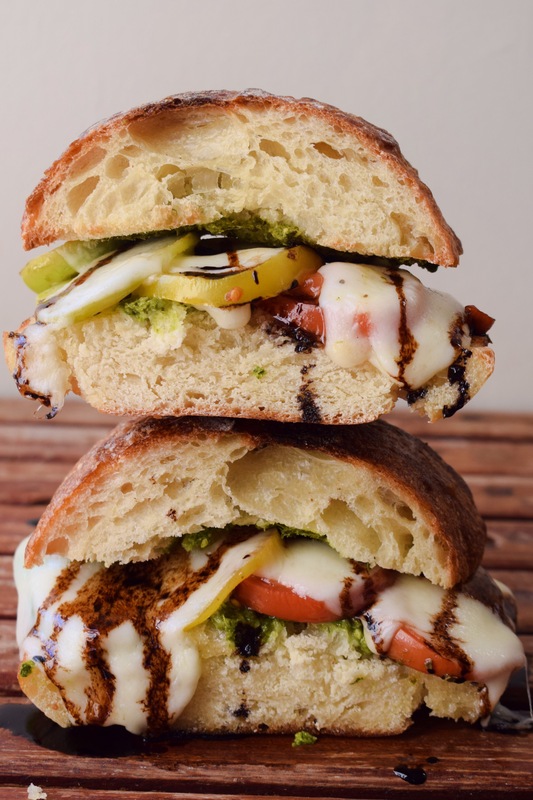 There was one particular sandwich that sealed the deal and it was this caprese sandwich. Made by an Australian man in Interlaken, Switzerland, I had this sandwich alongside a blood orange cocktail; incredibly incongruous but in that moment, I didn’t feel lonely. At that point, I had been without family for 3 weeks and I was feeling that ache in my chest commonly known as homesickness. There’s a reason why a large portion of Zimbabweans choose to migrate to Australia. Their culture is very similar to ours, our weather patterns are almost identical and our accents are indistinguishable to the average European/American. Seriously, I have been asked way too many times if I’m from Australia or New Zealand. For this one plucky restaurant owner, his friendliness and sage in helping me choose a meal I’ll never forget uplifted my spirits after a long day of hiking. Upon my return to Zimbabwe, I spent my time in the kitchen trying to recreate the magical sandwich. To some extent, my circumstances created some of the magic around the sandwich; I had been travelling alone for a week and I hadn’t had anything to eat that day since descending the mountain. The prospect of a new friend and a killer cocktail made me enjoy the meal so much more. Cheers to familiar faces in strange places! 1 loaf of ciabatta bread, sliced in half horizontally then cut into sections. Optional for serving: balsamic reduction, just boil 1 cup of balsamic vinegar until thick and reduced by half. 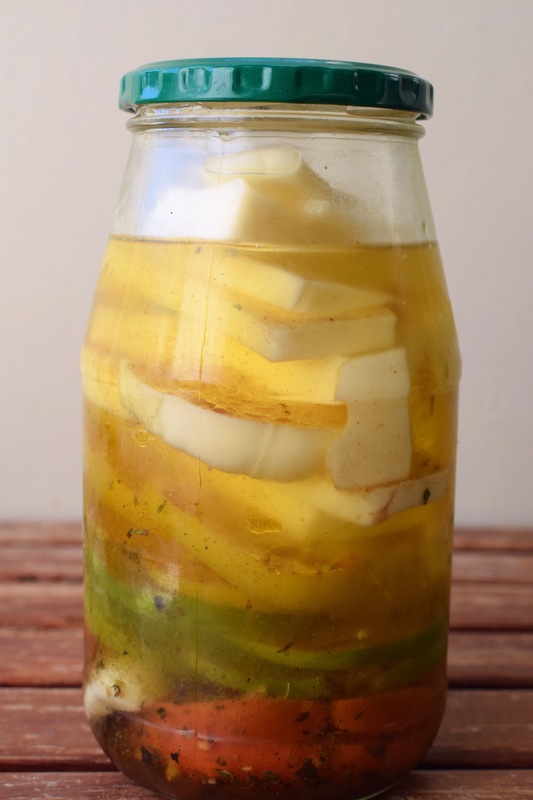 Combine the olive oil, garlic cloves, honey, lemon zest, black pepper and chilli flakes in a large airtight glass jar. Seal tightly and shake the jar to combine everything. Normally I would microwave the jar for 30 seconds to infuse the olive oil with the spices but this isn’t necessary. 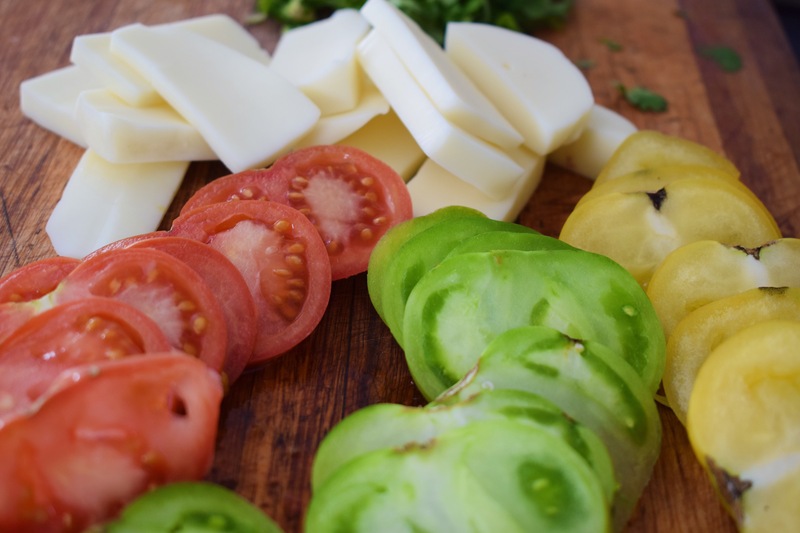 Throw the mozzarella and tomatoes into the olive oil mixture, seal the jar and shake to soak the tomatoes and cheese in the oil. Allow to sit at room temperature for at least an hour but for best results, leave overnight. Meanwhile, make the balsamic reduction if using. Heat your grill/broiler. Spread both halves of the ciabatta bread with the spinach pesto. Layer one half of the sandwiches with the tomatoes followed by the marinated cheese. 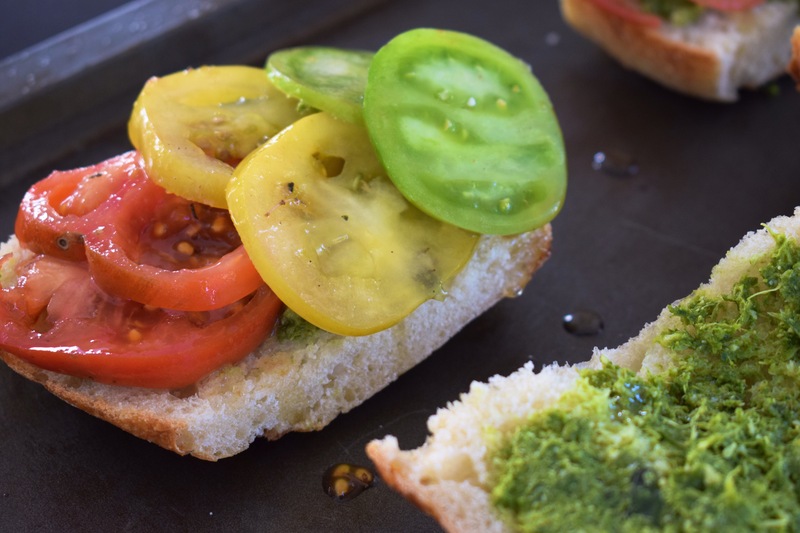 Add both halves of the sandwiches to a baking tray, with the empty half pesto-side up. Grill the sandwich until the cheese has melted, about 5 minutes. If desired, you can leave it until the cheese is starting to turn golden brown, about another 5 minutes. Serve hot whilst the cheese is still gooey with the balsamic reduction!